A special Tea Party was held on Thursday April 5th at The Royal Castle Hotel to celebrate the making of the 3000thMayflower Pennant. Organiser Rose Williams thanked her pennant maker supporters and also shared with the team the immense amount of generous support being offered by people and companies, some of whom are providing the binding and reels of cotton, and others far and wide who continue with the pennant making task. 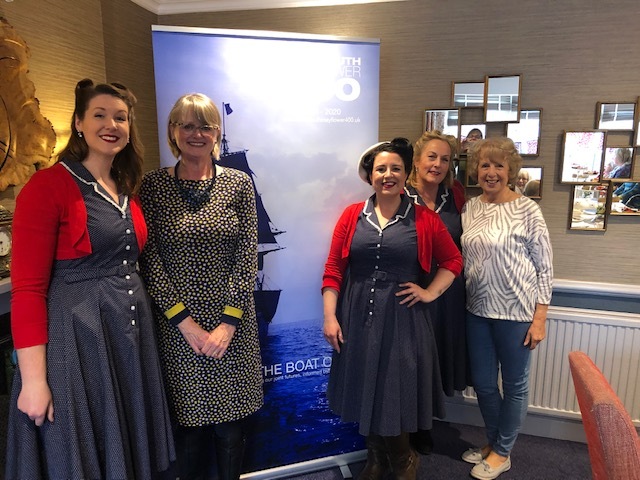 The Afternoon was superbly entertained by a 1940’s style singing trio “The Liberty Sisters” We hope that they will return to delight us during Mayflower Week!